Collections >> The North Carolina Experience >> Document Menu >> 2nd Frontispiece - 10. H. E. Fries. 11. W. S. Primrose. 12. Frank Wood. 13. N. B. Broughton. 14. J. B. Cottfield. 15. J. L. Nelson. 16. H. B. Battle, Director. 17. S. L. Patterson, Commissioner. 18. T. K. Bruner, Secretary. BOARD OF AGRICULTURE AND OFFICERS. 10. H. E. Fries. 11. W. S. Primrose. 12. Frank Wood. 13. N. B. Broughton. 14. J. B. Cottfield. 15. J. L. Nelson. 16. H. B. Battle, Director. 17. S. L. Patterson, Commissioner. 18. T. K. Bruner, Secretary. 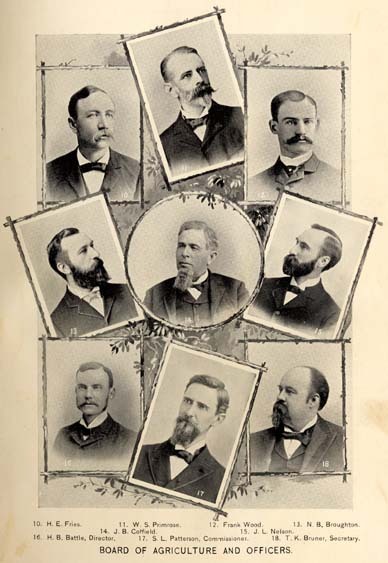 BOARD OF AGRICULTURE AND OFFICERS. Battle, H. B. (Herbert Bemerton), 1862-1929.